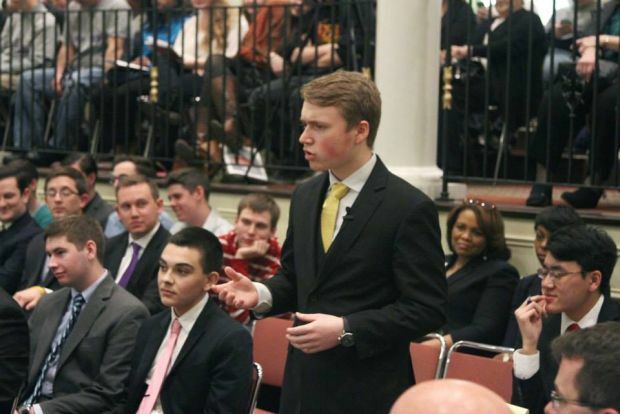 Roman Catholic’s mock trial team finishes 2nd in Pa.
Roman Catholic senior George Zindel, team captain, argues the case before the mock trial’s presiding judge, state Supreme Court Justice Correal Stevens. The mock trial team of Roman Catholic High School placed second by a whisker in the finals of the state mock trial tournament March 28-30 in Harrisburg. The Cahillites competed against 326 teams in the state before losing a 5-4 decision to Altoona Area High School. 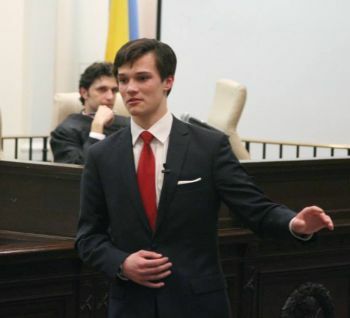 The teams debated in a mock courtroom whether a private school was liable in a case involving the death of a high school track athlete who abused performance-enhancing drugs. The final round was by Pennsylvania Supreme Court Justice Correal Stevens presided over the trial, which will be televised on the Pennsylvania Cable Network (PCN) Friday, April 4 at 7 p.m., Saturday, April 5 at 2 p.m. and Monday, April 7 at 10 p.m.
Roman Catholic capped a stellar season with a win over rival Girard College for the city championship March 15 at the Beasley School of Law at Temple University in Philadelphia. In addition to Roman’s runner-up status in the state tournament, the team also placed fifth at the University of Pennsylvania tournament, fourth at La Salle University, third at Yale University and first at the University of Pittsburgh. Other Catholic high schools located within the Archdiocese of Philadelphia sent teams to the state mock trial tournament. They included: Bishop Shanahan, Devon Prep, Malvern Prep, Academy of Notre Dame, Villa Maria Academy, Archbishop Carroll, Msgr. Bonner and Archbishop Prendergast, Cardinal O’Hara, Merion-Mercy Academy, Archbishop Wood, Holy Ghost Prep, Father Judge, Nazareth Academy, St. Joseph’s Prep, Neumann-Goretti, Gwynedd-Mercy Academy, Mount St. Joseph’s Academy and La Salle College High School.